- but I can't get the glide to work properly! I've grounded the TL072 op amp chip to the werkstatt and tried taking the power from the KB CV, the Gate and the EG on the Werkstatt and the +3.5 and +5v from the MIDI shield. The +5 on the MIDI/CV is the least worst in that it appears to be engaging the circuit properly - I can hear the glide duration change when I alter the glide potentiometer. But, when I play the lowest 4 notes on the midi keyboard, the glide circuit outputs high (4.47v) then the rest of the four octaves go from 1.44v to 4.47v but all out of tune. So the glide circuit is basically changing the voltages and I can't for the life of me work out why or what the best way is to go about fixing it. I'm a novice, so hopefully I'm doing something basic wrong. Any help greatly appreciated!! TL072 is not a rail-to-rail opamp, so you won't get it to output that range of voltages with only a 5V supply. Try running it from the 9V rail. Thank you! I will try this at the weekend and report back. Due to a quirk of the TL072 (Google "TL072 phase inversion"), you may still have the problem with the lowest notes. You may need to use a different opamp for this purpose - ideally one specified for single supply use (no negative supply). LM324 is one that should work in this circuit, but you'll have to check the pinout since it's a quad opamp. What opamps do you have available? 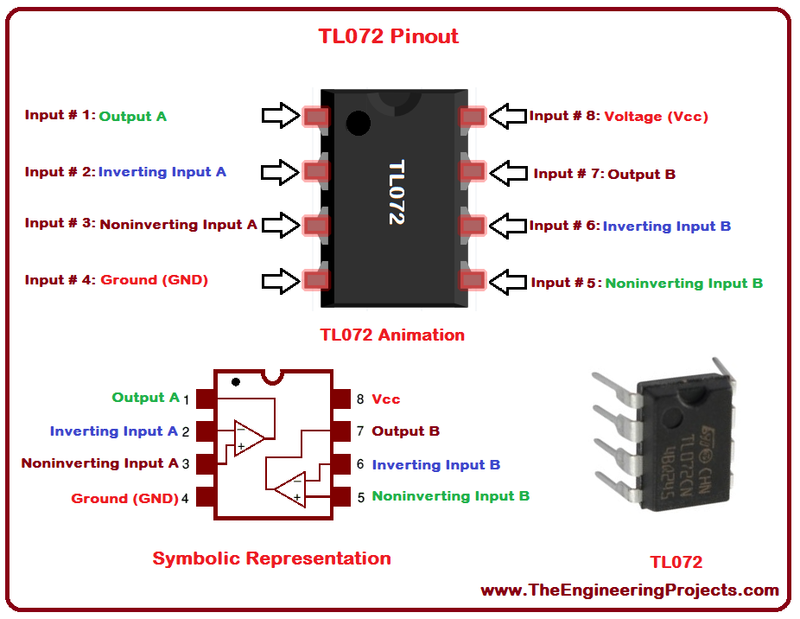 I think here we have to discus first about the TL072 pinout like in the image.